Beginning the final day on 144-3, the visitors still had a challenge to score the 68 runs that would carry them over the line on a gloomy morning. Van Zyl continued his brilliant knock , defying the hosts with a resilient performance before upping the ante. Laurie Evans did offer a chance in the morning session when he drilled a Chris Rushworth delivery straight to Jack Burnham at cover, but Evans made the most of his second life, reaching fifty from 104 deliveries, his first first-class half-century for Sussex. Van Zyl then reached three figures for the 26th time in his first-call career with a nudge down to fine leg. Salisbury removed Evans leg before for 51 with the scores level, but Ben Brown knocked off the winning runs from his first ball to guide Sussex over the line, capping a fine performance on the road from his side. Speaking at the conclusion of the match, van Zyl said: "To get a hundred in the last innings on the last day, I'm very proud of it. It's a great win for us. I was out injured for a lot of last season and now to come back to get the win is very sweet. The Leicestershire game was disappointing. We let ourselves down there. That's why this win means a lot to us just to get that first win of the season. It's crucial for any team. "Luke Wells saved up from 70-7 to get us back to only 22 behind - that was an unbelievable innings. It was a cold four days, but we knew that. To go through it and get a win was good for us and team morale. We knew if we got a partnership going this morning to get the runs to win below fifty we would see the body language in the field go down, then we could capitalise. The wicket was okay when the ball was softer. You just had to hang in there and get the runs." Be part of something special in 2019. 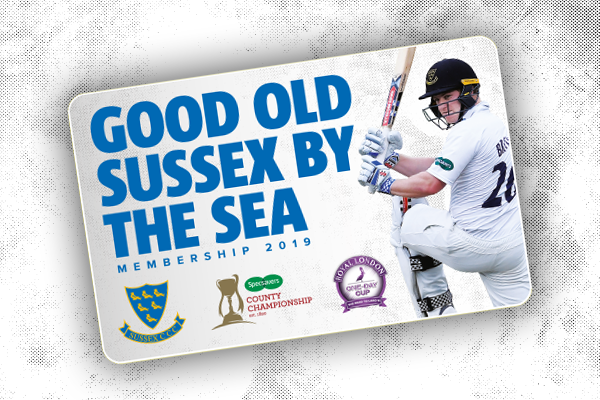 Become a Sussex Member today.